At the beginning (Ivanova's mousetrap) why didn't the raider's "battlewagon" (to use Sheridan's words) and the Sheridan's whitestars SEE each other in hyperspace before they jumped to normal space? Since they both jumped out to the same location, they should've been in about the same location in hyperspace. Possibly it is easier to hide in hyperspace than in normal space, particularly if you can move away from the hyperspace beacon. In No Surrender No Retreat the White Stars were able to hide from Starfury patrols. Or possibly it is some stealth technology based on Minbari and Vorlon technology (the Minbari stealth technology from Points of Departure, and the Vorlon 'folding space' technique in The Summoning). The thing is, they were both jumping from hyperspace to the same area of normal space, so they should've been within visual (eyeball) range in hyperspace, let alone within sensor range. Whitestars never used the Vorlon, hyperspace-fold technique. 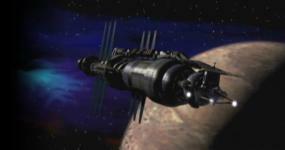 Whitestars were also routinely seen on sensors in "Babylon 5" both in normal space and in hyperspace. Theoretically, they could have been anywhere in a 360degree sphere around the point in normal space where they were going to jump TO, and the radius of the sphere of potential JUMP FROM points should be the length of each ship's vortex. That whole mousetrap surprise just seems sloppy to me. Yeah, plot contrivance was the other possibility I neglected to mention. You could probably fudge it and just say it is the vagaries of hyperspace, or the raider's scanners were not top of the range, or the White Stars did have the stealth tech that the Minbari had it, but the series wasn't consistent about this. The White Stars were detected by the Pollux's scanners in No Surrender No Retreat, for instance, when they shouldn't have been if they were using Minbari tech, yet in the same episode they are able to hide in hyperspace. I never rewatched those movies other than ITB. I liked the idea of the plotlines in Thirdspace and Legend of the Rangers but not the final products. Those are the two B5 movies that I'd like to drop into a black hole. Thirdspace could and should have been so much more. the premise is fine.. it's just got so much filler. I feel it also fell down due to it not being scary enough. Could have been better. LOTR fell over for me with those cheesy pike fighting scenes... and then that utterly retarded weapons array. I think the only B5 TV Movie I really rate is ‘In the Beginning’, because it serves a purpose and adds real depth to the story. Thirdspace is strictly okay. As you said, it would have done with being creepier. Also, the ‘kill it with a nuke’ finale was also a tad chliched. It seems like a wasted opportunity to delve deeper into Vorlon history. I appreciate River of Souls, but only as an unintentional comedy, Martin Sheen hams it up so badly that I just couldn’t stop laughing the first time I saw it. That opening scene just kills me every time. The less said about LOTR the better. Some of the ideas are fine, but the execution was awful. I don’t buy the excuse that it’s ‘just a pilot’, a pilot needs to be strong than it was to draw people in. It’s a fine example of why B5 didn’t need spin off shows. I know it wasn’t scripted that way, but the fact that this got past the producers, director and JMS. I remain slack jawed in awe that it wasn’t left on the cutting room floor. Someone should have demanded a reshoot of that scene. At the very least, they could have just kept the CGI, but removed the kicking, screaming floating woman, and just cut to scenes of people at consoles looking busy. That scene has become the laughing stock of SF Space battles. I feel sorry for the actress that played the role, because that must have done more harm than good to her career! Last edited by Ubik; August 28th 14 at 08:08.